In the not-so-distant past I started a basic triangular shawl (or so I thought), but I wasn't paying attention to my increases and, suddenly, I had In the Shallows. It worked out so well I tried some variations, so there are plain and fancy versions. It makes for a cozy bit of color popping out of your coat collar this winter or an added bit of flair when spring comes. What's that? You have more sock yarn? You're in luck! In the Shallows will allow you to use up just about every last yard in a cozy shawl to be tossed casually around your neck like a scarf, work bandit style, or gently draped across your shoulders for modesty or warmth--the shallowness of the triangle makes long ends that can be tied, if you like. And the fabric choice is yours: Plain (garter) or Fancy (eyelet). 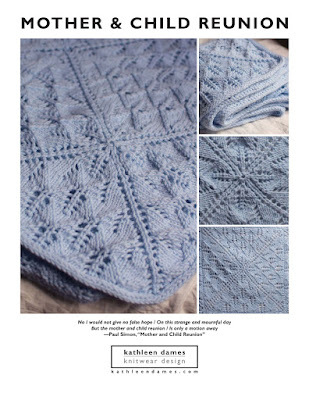 The pattern is available here on Ravelry or you can purchase it immediately using the button below. Last summer I fell in love with some madelinetosh dk yarn in Mourning Dove at Purl Diva, and I decided to turn it into a cardigan. But not just any cardigan, of course! I started to think about different methods of shaping knit fabric and wanted something that shaped the waist without traditional waist-shaping. And I really wanted to try out seamless set-in sleeves. So, armed with some interesting ribbing patterns and my interpretation of EZ's über-cleverness, Turn of the Glass was born. Where did the name come from? One of the rib patterns is Little Hourglass Rib (the other is Reverse Cross-Stitch Rib - not quite as poetic). Mash that up with my focus on shaping and penchant for all things nautical, and Turn of the Glass just seemed to fit. I hope you like it - I wore mine again yesterday and am looking forward to wearing it next weekend at Vogue Knitting Live! Maybe I'll see you there. The pictures here are from the first photo shoot (see the Flickr set here), showing the sweater with one of Leslie Wind's beautiful "C" pins, which is the way I wear it most of the time. However, we wanted to show it worn open on Knitty (and looking more wintry), hence, the photo that shows me with some faux snow at Thanksgiving, though it sure was cold enough for the real thing. Apparently, they were shooting Contagion at one of the grade schools in my hometown (and I missed my chance to meet Kate Winslet, Gwyneth Paltrow, Matt Damon, etc. - shoot!). We were driving by and managed to snap some shots before the Teamsters pulled up the white tarps and carried off the polyfill batting. *I don't know why the exclamation point was necessary, either, but maybe it will be that exciting. I'm off to VKL tomorrow morning (early). My first class, with the charming Franklin Habit, begins at 8:30. Here's to hoping tonight's snow doesn't mess anything up in our carefully choreographed morning hand-off (Nick has to go get his son in Queens for school here in Morningside Heights, and I will meet him there with Isobel, whose school it also is, and Penelope, who is not really up for a class on lace). After that it's Stephanie's lecture, the first of two cable classes this weekend (the second is with someone named Debbie Bliss), then a marketplace preview before hitting the Purls and Prosecco reception. Yippee! I'll be wearing Turn of the Glass - if you see me/her (girl sweaters are always her, aren't they? ), be sure to say hi. Saturday, after Ms. Bliss's class, I'm going to learn about Estonian Nupps and such, attend the panel on Designing for the Hand-Knitting Market, and enjoy the dinner and Marvelous Mohair fashion show before heading to Williamsburg for a friend's 40th birthday party at a place called Barcade where they have a ton of old arcade games. Let's see if I remember how to play Ms. Pac-Man. And I'll be sporting my newest sweater, Grés, which wasn't completed in time to enter the Marvelous Mohair competition, but that's OK.
Sunday I get to attend a class with Meg (yes, that one, Mrs. Swansen to you and me) on EPS, Franklin's lecture on the history of lace knitting patterns, and when I'm completely exhausted a class on designing your own knitting patterns. Not sure what I'll wear that day, probably my PJs, since I'll be extremely tired from all the knitting excitement topped by a late night in Brooklyn. I'm very excited for all my classes and looking forward to the marketplace and seeing all sorts of people. Have a great weekend, and I'll try to take pictures and post them on Monday. Okay, it's not really week two of Grés, at least not sequentially, but it is the second week I'm really working on it. You've made both of your sleeves, right? Now it's time to work the bodice! BODY Provisionally CO 152, join, k 1". Inc 19 sts evenly over half (front). K 7", join sleeves to body, decrease @ raglans every other row. Can't decide on yoke for gres sweater: round or raglan? Ended up choosing a round yoke here, so ignore that bit about "decrease[ing] @ raglans every other row." Yoke: Set aside 8sts ea from sleeve sts & both sides of body. Join sleeves and body, mark EOR, and work even in the round for 2". K3, k2tog 1rd. K 2". K2, k2tog 1rd. K 2". K1, k2tog. K 1", p 1rd, k 1". Fold @ p rd. Sew live sts from ndl 6r below p rd. Small yoke change: k add'l 1" before p rd then k1 k2tog around. Work hem facing back&forth. Feed elastic through slit if needed. Body: pick up sts from prov CO & k 1". K25, m1, k1, m1, k25, m1, k1, m1, k25, m1; rpt. K 2". Inc again. K desired length. P rd.